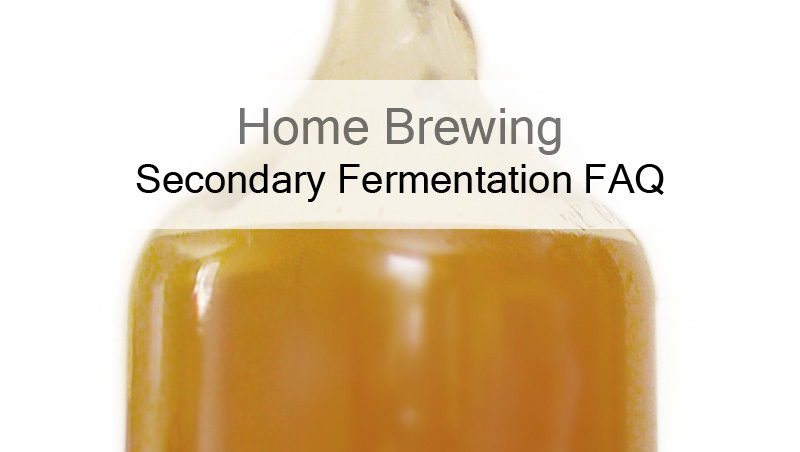 All About Secondary Fermentation – The Two Stage Fermentation FAQ – Food. Beer. Stuff. A secondary fermentation is when your fermented beer is transferred from the primary fermentation vessel to a secondary vessel. This will be done for a variety of reasons which differ from beer to beer and even brewer to brewer. Secondary fermentation is also known as two stage fermentation, the conditioning phase or simply a secondary. Brewers perform a secondary for various reasons. The most common being for beer clarification and conditioning. When the beer is transferred to the secondary vessel, much of the yeast, hops and other solids present in the beer are left behind in the primary vessel removing any chance that they will go back into suspension when transferred to bottles or kegs later on resulting in a potentially clearer beer. Brewers also transfer to secondary for long term aging. When creating a lager or conditioning a higher ABV ale, brewers may wish to transfer to a glass vessel from the more common plastic primary vessels as the properties of glass are better suited to keeping the beer from becoming oxygenated over long periods of time. Aside from clarification and conditioning brewers may also employ a secondary when adding additional adjuncts such as fruit, wood chips, ginger or when dry hopping. When Should I Transfer My Beer To The Secondary Vessel? The important thing to remember when transferring to a secondary vessel is that you want to make sure you are very close if not already hitting your FG. If transferred too early, there may not be enough yeast transferred over to finish the fermentation, resulting in a hung or stuck fermentation. Some people recommend that you transfer right before hitting FG as this will allow the yeast to produce excess CO2 which may help fight against the risk of oxygenation. Such may not work well with a higher ABV beer as you also want to allow the yeast time to clean up and condition your beer after they have consumed all of the fermentable sugars. For this reason, I always suggest waiting at least 1 week after hitting FG before making the transfer. Do I Have To Dry Hop In Secondary? Generally speaking, it would be better to dry hop in a secondary as this will limit any negative interactions between the hops and the yeast. That being said, at the scale home brewers usually brew at (5 to 10 gallons at a time) this isn’t necessarily a big deal. As the scale is increased to commercial sizes, this becomes more of a concern. You heard right, moving your beer from one vessel to another can potentially expose it to bacteria, oxygen, wild yeast and other stuff that you don’t want in your beer. It is important to be very careful when you transfer your beer to avoid messing up the whole batch. This also means that unless you have a good reason to use a secondary fermentation, it may not be worth the trouble and risk. This is another one of those things that effect the commercial brewer but is not necessarily something to worry about on the scale of the home brewer. Autolysis is the name given to when yeast die and burst. This can create off flavors in your beer if it occurs (meaty/rubber like I hear). Anyhow, removing the beer from the yeast, as happens when racking to a secondary can help lower the odds that this will occur as the majority of the yeast is left behind in the primary vessel. All this being said, if you use fresh yeast and follow proper pitching rates autolysis is not really a concern. Most likely your yeast will simply go into hibernation so most brewers don’t recommend a secondary just to lower the risk of autolysis for home brewers. Do you have any questions about two-stage or secondary fermentations? Ask below in the comments (no login required) and I’ll answer you ASAP.